Last weekend the weather was miserable. Cold and intermittent showers. 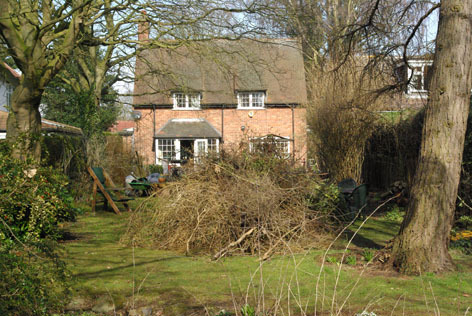 But our friends, Steven and Lynne, drove out to Hornsea complete with all their professional gardening gear and proceeded to chop and trim our hedges which had grown leggy and far too tall. Dead bushes were dealt with, and those still with signs of life were pruned, to give them a chance to survive. Secateurs, resurrected with WD 40, were used a great deal last weekend. 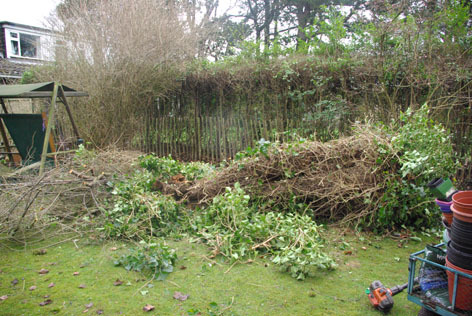 And Steven’s huge hedge-trimmers easily cut through the Ivy mountain that had grown around a rotten tree stump. Once the dried up and very dead tall stump was unveiled, Steven gave it a gentle push and it fell to the ground. No more danger to the grandchildren or animals! Rotten tree-trunk sorted by Steven! What with all the dead bushes, hedge trimmings, tree-trunk and ivy, we ended up with a huge amount of debris piled up in various parts of the lawn. If only it had been November 5th, Bonfire Night, we would have had a huge mountain of a bonfire. But we have ended up with 4 different piles of garden waste to burn. Erik and myself also worked in the garden with Steven and Lynne, desperate to bring more light onto the big lawn we have inherited with our new house, and by the end of the day, the difference was amazing. The back of the house faces south, and from our bedroom window we see the most amazing sunrises in the East, lots of sun as it moves around during the day, and then brilliant sunsets as the sun fades into the West, so it is the perfect situation. 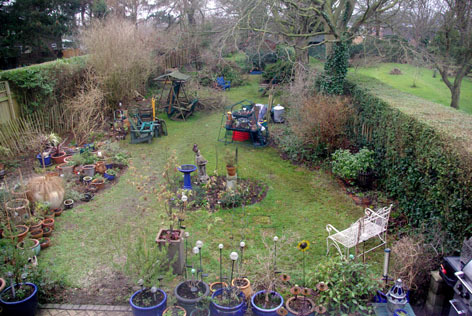 And now that all the dead foliage is chopped down, there is a lot more light shining on the garden. This will be very important for our new Kitchen Garden, which I am planning on paper at the moment. I have little cut-out 8 ft x 4 ft and 4 ft x 4 ft pieces of paper (our raised-beds) which I am moving around on a large sheet, trying to get the best shape and the plants in the correct positions. The tall vegetables (Runner Beans)must not shade the smaller veg (carrots or lettuce) etc. So although our garden has been attacked, there were some surprises. We discovered a sunken area, but it was covered with mud and a tree was sprouting up from the lowest point. Lynne took it on herself to see what she could uncover, and it turns out to have steps down one side and up the other. Under the thick mud, at the bottom, Lynne discovered what looks like Yorkstone flags. 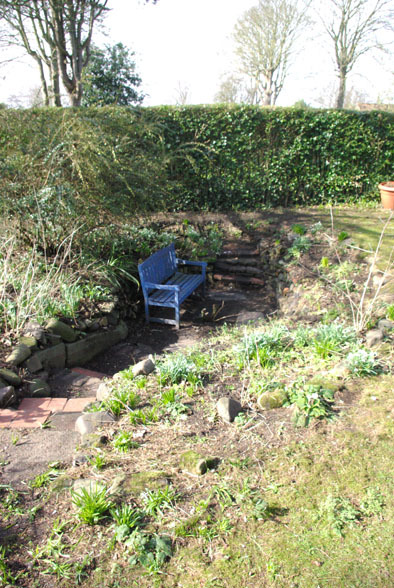 The sides are covered with Snowdrops and little rockery plants desperate to come back to life. 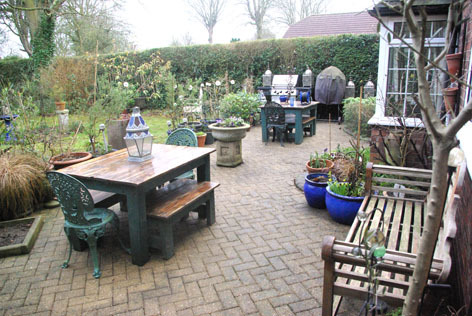 The one part that we have tidied up is our Patio. Erik now calls it the ‘Pop up Patio Cafe’. But it is so sheltered and private, and before long (fingers crossed with our wierd English weather at the moment) we will be firing up the Wood-fired Oven and the Barbecue. Can’t wait for that. It’s a great place to just sit and imagine how the garden will look in the not too distant future. Magnificent and Scary – the waves pounding the Hornsea shore. This picture above was taken yesterday morning. This is what it is all about. 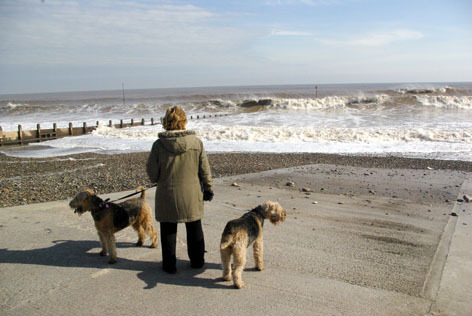 5 or 6 minutes walk from our house takes us to Hornsea Beach. And what incredible waves were pounding the shore. Huge waves, scary and magnificent at the same time. The sound of the sea could be heard from quite a distance away. But both Erik and I agreed that although we chose to move to Hornsea, we never realised that we would enjoy living so close to the sea so much. It’s brilliant!